Successful "Date Certain M&A" of InterValve, Inc. its Assets and Intellectual Property -- Gerbsman Partners, January 19, 2017. "Date Certain M&A of Igenica, Inc." its Assets and Intellectual Property -- Gerbsman Partners, January 4, 2017. "Date Certain M&A" of Rio Grande Neuroscience, Inc. - its Assets and Intellectual Property -- Gerbsman Partners, December 12, 2016. "Date Certain M&A" of InterValve, Inc., its Assets and Intellectual Property -- Gerbsman Partners, October 12, 2016. Successful "Date Certain M&A" of Uptake Medical, Inc. its Assets and Intellectual Property/a> -- Gerbsman Partners, August 8, 2016. Successful "Date Certain M&A" of Palmaz Scientific, Inc. its Assets and Intellectual Property to Vactronix Scientific, Inc. -- Gerbsman Partners, August 2, 2016. "Date Certain M&A" of POLYREMEDY, INC., dba Nuvesse Skin Therapies- its Assets and Intellectual Property -- Gerbsman Partners, June 27, 2016. Update to the Update Bidding Process for "Date Certain M&A" of Uptake Medical Corp., its Assets and Intellectual Property – detail schedule of "Asset List" -- Gerbsman Partners, June 25, 2016. Gerbsman Partners announces Strategic Alliance with David G. Rosenbaum - Rosenbaum IP -- Gerbsman Partners, June 14, 2016. Date-Certain M&A of Compliance and Process Manufacturing Analytics Company with World-Class Clients -- Gerbsman Partners, May 5, 2016. "Date Certain M&A of Palmaz Scientific" its assets and Intellectual Property -- Gerbsman Partners, March 7, 2016. Successful Acquisition of Medical Device Intellectual Property/Patents by Gerbsman Partners for a Coronary Vascular Medical Device Company -- Gerbsman Partners, September 28, 2015. Portfolio Advisory Services for Equity and Senior Lenders -- Gerbsman Partners, July 23, 2015. Intellectual Property/Patent Acquisition Opportunity from Bell and Howell -- Gerbsman Partners, November 12, 2015. Targeted Acqui-Hire: E-Commerce Division of Fortune 100 Seeking Acqui-Hire for World Wide E-Commerce Development -- Gerbsman Partners, October 13, 2015. The China Syndrome - The Black Swan Pushes Events to the Tipping Point-Maximizing Enterprise Value in the upcoming Crisis -- Steven R. Gerbsman and Robert Tillman, August 28, 2015. Successful "Date Certain M&A" of Raydiance, Inc., its Assets and Intellectual Property -- Gerbsman Partners, July 27, 2015. Date Certain M&A of Raydiance, Inc., its Assets and Intellectual Property -- Gerbsman Partners, June 9, 2015. Gerbsman Partners announces "Strategic Alliance" with Michael Steele, The Steele Group/a> -- Gerbsman Partners, May 17, 2015. Portfolio Advisory Services for Equity and Senior Lenders -- Gerbsman Partners, May, 2015. DATE CERTAIN M&A OF DIGITAL CADDIES INC. -- Gerbsman Partners, April 27, 2015. Emerging Growth Debt, Part II: When It's Heading South: Insolvency and Related Considerations - Maximizing Enterprise Value - Steven R. Gerbsman guest panelist -- Gerbsman Partners, April 15, 2015. The Black Swan Pushes Events to the Tipping Point + Maximizing Enterprise Value in the upcoming Crisis -- Gerbsman Partners, March 24, 2015. Bidding Process for Date Certain M&A Palyon Medical Corp., its Assets and Intellectual Property -- Gerbsman Partners, Feb 2, 2015. "Date Certain M&A" of Palyon Medical Corp., its Assets and Intellectual Property -- Gerbsman Partners, January 26, 2015. INSTACAMP NYC - INSTAGRAM FOCUSED MARKETING CONFERENCE - Flashstock presents -- Gerbsman Partners, January 14, 2015. Successful Acquisition of BioPharmaceutical Intellectual Property -- Gerbsman Partners, January 13, 2015. "Terminating/Restructuring Prohibitive Real Estate, License, Payables & Contingent Liabilities" -- Gerbsman Partners, January 11, 2015. UC Berkeley Center for Executive Education - Outstanding Contribution -- Gerbsman Partners, January 2, 2015. Successful "Date Certain M&A" of AxioMed Spine Corp. it Assets and Intellectual Property -- Gerbsman Partners, November 5, 2014. Monday, October 27 - Steven R. Gerbsman is a guest on Bay Area Ventures - SiriusXM Radio Wharton School, channel 111 -- Gerbsman Partners, October 23, 2014. PBS News Hour video - "When to pull the plug on a dying startup company" Steve Goldbloom reporting - Steve Gerbsman 5 minutes and 39 seconds into video -- Gerbsman Partners, October 23, 2014. Update to The Bidding Process, Procedures for the Sale of certain Assets and Intellectual Property of AxioMed Spine Corp. -- Gerbsman Partners, October 20, 2014. October, 2014 Date Certain M&A of AxioMed Spine Corp., its Assets and Intellectual Property -- Gerbsman Partners, October 2, 2014. FlashStock & Percolate Present: The Busy Marketer's Guide to Image Rights Management by the FlashStock team -- Gerbsman Partners, August 29, 2014. Fenwick & West 2Q 2014 Venture Capital Survey by Barry Kramer and Michael Patrick -- Gerbsman Partners, August 8, 2014. The Advantages of a "Date-Certain" Mergers and Acquisition Process Over a "Standard Mergers and Acquisitions Process" -- Gerbsman Partners, July 8, 2014. Successful "Date Certain M&A" of ClearEdge Power, LLC, its Assets and Intellectual Property to the Doosan Corporation. Gerbsman Partners, Financial Advisor -- Gerbsman Partners, July, 2014. Successful "Date Certain M&A" of GluMetrics, Inc., its Assets and Intellectual Property -- Gerbsman Partners, March, 2014. Successful "Date Certain M&A" of Bell & Howell Intellectual Property/Patents -- Gerbsman Partners, March, 2014. Identifying Early Warning Signs & Maximizing Value of Distressed Portfolio Companies - Presentation at Stanford University by Mr. Steven Gerbsman -- Gerbsman Partners, February, 2014. Life Lessons for Turbulent Times - Memoirs of a Crisis Manager -- Gerbsman Partners, February, 2014. The Black Swan Pushes Events to the Tipping Point-Maximizing Enterprise Value in the upcoming Crisis -- Gerbsman Partners, January, 2014. The Silly Season Again - Are We in For Another Bubble? -- Gerbsman Partners, January, 2014. Patricia McGovern - A Brave & Beautiful Person - May She Rest in Peace -- Gerbsman Partners, January, 2014. 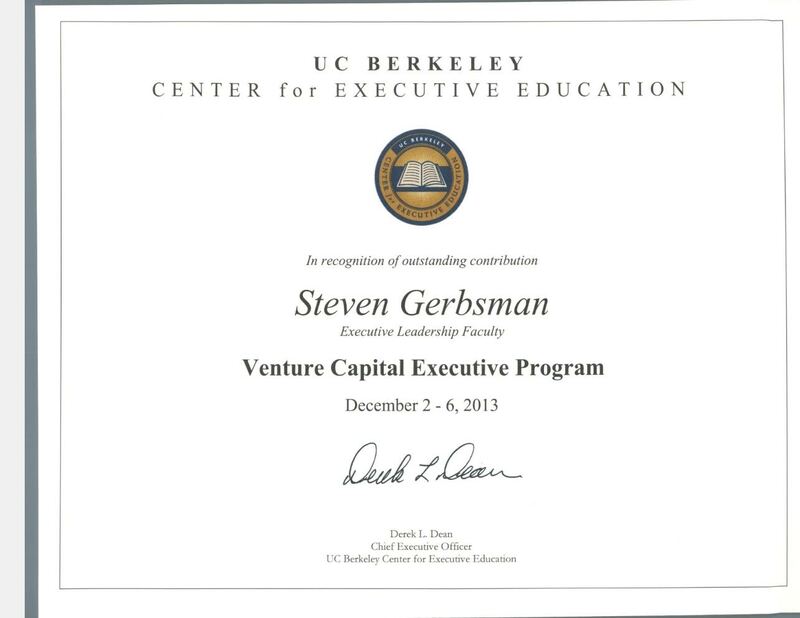 Steven R. Gerbsman, Outstanding Contribution - UC Berkeley Center for Executive Education - Executive Leadership Faculty, Venture Capital Executive Program -- Derek L Dean, December, 2013. Successful "Date Certain M&A" of a Software-as-a-Service (SaaS) provider of digital marketing suites company, its Assets and Intellectual Property -- Gerbsman Partners, October, 2013. Intellectual Property/Patent Acquisition Opportunity from Bell & Howell -- Gerbsman Partners, October, 2013. Maximizing Enterprise Value - Partial Industry and Client Summary -- Gerbsman Partners, September, 2013. Gerbsman Partners "Date Certain M&A" for the Assets and Intellectual Property of Optify, Inc. -- Gerbsman Partners, September, 2013. Gerbsman Partners Successful "Date Certain M&A" of Syncapse, Corp., its Assets and Intellectual Property -- Gerbsman Partners, September, 2013. Successful "Date Certain M&A" of Medical Device company, its Assets and Intellectual Property -- Gerbsman Partners, March, 2013. Maximizing Enterprise Value - Partial Industry and Client Summary -- Gerbsman Partners, January, 2013. Terminating/Restructuring Prohibitive Real Estate, License, Payables &mp; Contingent Liabilities -- Gerbsman Partners, February, 2013. Cupcake Digital's Infusion of Common Core Standards Positions the Company for Continued Growth and Leadership -- Gerbsman Partners, February, 2013. Ultratech buys Cambridge Nanotech assets, adds ALD tech - by James Montgomery -- Gerbsman Partners, December, 2012. Cambridge NanoTech, Inc. - Date Certain M&A of Assets and Intellectual Property -- Gerbsman Partners, November, 2012. AQT Solar, Inc. - "Date Certain M&A" of its Assets and Intellectual Property -- Gerbsman Partners, August, 2012. LumaTherm, Inc. - "Date Certain M&A" of its Intellectual Property and Assets -- Gerbsman Partners, July, 2012. The Perfect Storm Revisited - 2012 -- Gerbsman Partners, May, 2012. Successful termination and restructuring of "Prohibitive Executory Real Estate Contract" -- Gerbsman Partners, April, 2012. Smart software changes the Energy market - Gerbsman Partners update -- Gerbsman Partners, April, 2012. The Advantages of a "Date-Certain" Mergers and Acquisition Process Over a "Standard Mergers and Acquisitions Process" -- Gerbsman Partners, February, 2012. Date Certain M&A of Cortical PTY Ltd. - its Assets, Intellectual Property and Trade Secrets -- Gerbsman Partners, December, 2011. Executive Presence: How to Dress for Success - featuring Lauren Rothman, founder of Styleauteur -- Gerbsman Partners, October, 2011. Alure Medical, Inc. - Date Certain M&A of its Intellectual Property and Assets -- Gerbsman Partners, October, 2011. Can you put a price on branding? -- Gerbsman Partners Update, August, 2011. Gerbsman Partners - Principals -- Gerbsman Partners, August, 2011. "Terminating/Restructuring Prohibitive Real Estate, License, Payables & Contingent Liabilities" - - - "Maximizing Enterprise Value" through proprietary "Date Certain M&A Process" -- Gerbsman Partners, July, 2011. Steven R. Gerbsman, Principal of Gerbsman Partners – Speaker at iiBig, Investment and M&A Opportunities in Healthcare June 13-14, 2011 -- Gerbsman Partners, June, 2011. Steven R. Gerbsman will be a guest speaker at the Center for UC Berkeley Executive Education Venture Capital Executive Program May 16-20, 2011. -- Gerbsman Partners, May, 2011. Gerbsman Partners announces a strategic alliance with Foundation Ventures -- Gerbsman Partners, April, 2011. Successful "Date Certain M&A" of Medical Device company, its Assets and Intellectual Property -- Gerbsman Partners, April, 2011. Successful "Date Certain M&A" of Medical Device companies, its Assets and Intellectual Property -- Gerbsman Partners, February, 2011. 30th Anniversary -- Gerbsman Partners, February, 2011. Successful "Date Certain M&A" of Technology company, its Assets and Intellectual Property -- Gerbsman Partners, January, 2011. Successful "Date Certain M&A" of Medical Device company, its Assets and Intellectual Property -- Gerbsman Partners, October, 2010. The Advantages of a "Date-Certain M&A Process" over an "Assignment for the Benefit of Creditors - ABC" -- Gerbsman Partners, September, 2010. Successful termination and restructuring of "Prohibitive Executory Real Estate Contracts" -- Gerbsman Partners, September, 2010. Successful "Date Certain M&A" of Enterprise Software company, its Assets and Intellectual Property -- Gerbsman Partners, August, 2010. Successful "Date Certain M&A" of Medical Device company, its Assets and Intellectual Property -- Gerbsman Partners, July, 2010. Date Certain M&A of Teranode Corporation- its Assets and Intellectual Property -- Gerbsman Partners, June, 2010. Date Certain M&A of CardioMind, Inc.- its Assets and Intellectual Property -- Gerbsman Partners, April, 2010. How much value are you giving away by sharing you privacy? - Viewpoint from Tony Fish, Principal at AMF Ventures -- Gerbsman Partners, April, 2010. Steven R. Gerbsman, Principal of Gerbsman Partners will speak at iiBig Santa Monica, March 25 - 26, 2010 -- Gerbsman Partners, March, 2010. "Terminating/Restructuring Prohibitive Real Estate, License and Payable Contingent Liabilities" -- Gerbsman Partners, March, 2010. "Cleantech, the next Bubble to Burst" - An Industry Update from Gerbsman Partners. -- Gerbsman Partners, February, 2010. The Advantages of a "Date-Certain" Mergers and Acquisition Process Over a Standard Mergers and Acquisitions Process -- Gerbsman Partners, January, 2010. "Steven R. Gerbsman, Principal of Gerbsman Partners – Guest Lecturer/Participant at Georgetown Entrepreneurship Summit, January 29/30, 2010 -- Gerbsman Partners, January, 2010. "Maximizing Enterprise Value through Balance Sheet Restructuring & Date Certain M&A Process" -- Gerbsman Partners, November, 2009. Successful "Date Certain M&A" of Business Unit and its Assets and Intellectual Property -- Gerbsman Partners, October, 2009. Successful "Date Certain M&A" of Business Unit and its Assets and Intellectual Property -- Gerbsman Partners, August, 2009. Successful termination of "Prohibitive Executory Real Estate Contracts" -- Gerbsman Partners, August, 2009. Successful "Date Certain M&A" of Pegasus Biologics Inc., its Assets and Intellectual Property -- Gerbsman Partners, July, 2009. "Maximizing Enterprise Value through Balance Sheet Restructuring & Date Certain M&A Process" -- Gerbsman Partners, May, 2009. SUCCESSFUL DATE CERTAIN M&A OF "BUSINESS UNIT AND INTELLECTUAL PROPERTY" -- Gerbsman Partners, April, 2009. GERBSMAN PARTNERS UPDATE - Structuring Licensing Programs and Agreements -- Gerbsman Partners, April, 2009. GERBSMAN PARTNERS UPDATE - R.I.P. Dot Com. We barely Knew Ye! - Welcome the new sheriff in town the .TEL -- Gerbsman Partners, March, 2009. Worst Case Scenarios for Technology, Life Science and Medical Device companies -- Gerbsman Partners, March, 2009. SUCCESSFUL TERMINATION OF "PROHIBITIVE EXECUTORY REAL ESTATE CONTRACT" -- Gerbsman Partners, February, 2009. SUCCESSFUL DATE CERTAIN M&A OF "BUSINESS UNIT AND INTELLECTUAL PROPERTY" -- Gerbsman Partners, January, 2009. Gerbsman Partners closes 49th & 50th "Date Certain M&A" transaction of Business Units and Intellectual Property -- Gerbsman Partners, November, 2008. SUCCESSFUL SALE OF "BUSINESS UNIT AND INTELLECTUAL PROPERTY" -- Gerbsman Partners, October, 2008. The Advantages of a "Date-Certain" Mergers and Acquisition Process Over a Standard Mergers and Acquisitions Process -- Gerbsman Partners, September, 2008. M&A: Turnaround and Distressed Debt Opportunities -- Speaking Faculty Update -- iiBIG's 2008 Distressed & Turnaround Investment Forum, September 22-23, Las Vegas - Steven R. Gerbsman conference speaker. SUCCESSFUL SALE OF "BUSINESS UNIT AND INTELLECTUAL PROPERTY" -- Gerbsman Partners, September, 2008. SUCCESSFUL SALE OF "BUSINESS UNIT AND INTELLECTUAL PROPERTY" -- Gerbsman Partners, Septembe, 2008. SUCCESSFUL SALE OF "BUSINESS UNIT AND INTELLECTUAL PROPERTY" -- Gerbsman Partners, July, 2008. SUCCESSFUL SALE OF "BUSINESS UNIT AND INTELLECTUAL PROPERTY" -- Gerbsman Partners, May, 2008. Maximizing Enterprise Value through a "Date Certain M&A Process" and Balance Sheet Restructurings -- Gerbsman Partners, March, 2008. SUCCESSFUL SALE OF "BUSINESS UNIT AND INTELLECTUAL PROPERTY" -- Gerbsman Partners, March, 2008. Maximizing Enterprise Value for Technology and Life Science Companies and their Intellectual Property Utilizing a "Date-Certain" M&A Process. -- Gerbsman Partners, January, 2008. SUCCESSFUL SALE OF "BUSINESS UNIT AND INTELLECTUAL PROPERTY" -- Gerbsman Partners, January, 2008. Venture Capital Executive Program - UC Berkeley, Haas Business School  Steven R. Gerbsman Guest Lecturer -- Gerbsman Partners, November, 2007. The Tipping Point - It's Here -- Gerbsman Partners, October, 2007. Successful Sale of "Business Unit and Intellectual Property" -- Gerbsman Partners, October, 2007. SUCCESSFUL SALE OF "BUSINESS UNIT AND INTELLECTUAL PROPERTY" -- Gerbsman Partners, September, 2007. The Black Swan Pushes Events to the Tipping Point-Maximizing Enterprise Value in the Upcoming Crisis -- Gerbsman Partners, May, 2007. The Silly Season Again-Are We in For Another Bubble? -- Gerbsman Partners, February, 2007. Victor D. Hanna joins Gerbsman Partners Board of Intellectual Capital -- Gerbsman Partners, January, 2007. SUCCESSFUL RESTRUCTURING OF CREDITOR LIABILITIES AND TERMINATION OF PROHIBITIVE REAL ESTATE EXECUTORY CONTRACT -- Gerbsman Partners, January, 2007. SUCCESSFUL SALE OF "BUSINESS UNIT AND INTELLECTUAL PROPERTY" -- Gerbsman Partners, October, 2006. SUCCESSFUL SALE OF "BUSINESS UNIT AND INTELLECTUAL PROPERTY" AND "ORDERLY SHUT DOWN OF OPERATIONS" -- Gerbsman Partners, April, 2006. SUCCESSFUL SALE OF "BUSINESS UNIT AND INTELLECTUAL PROPERTY" AND "ORDERLY SHUT DOWN OF OPERATIONS" -- Gerbsman Partners, February, 2006. FORMATION OF TOTAL SPORTS MEDIA -- Gerbsman Partners, August 22, 2005. SUCCESSFUL SALE OF "BUSINESS UNIT AND INTELLECTUAL PROPERTY" AND "ORDERLY SHUT DOWN OF OPERATIONS" -- Gerbsman Partners, January 10, 2005. SUCCESSFUL "ORDERLY SHUT DOWN OF OPERATIONS" -- Gerbsman Partners, September 27, 2004. MAXIMIZING THE VALUE OF INTELLECTUAL PROPERTY -- Gerbsman Partners, September 20, 2004. GLENN BOSCHETTO AND RON BOSCHETTO JOIN BOARD OF INTELLECTUAL CAPITAL -- Gerbsman Partners, June 16, 2004. CONTRACT" -- Gerbsman Partners, May 6, 2004. CAPITAL -- Gerbsman Partners, March, 2004. CONTRACT" -- Gerbsman Partners, March 15, 2004. SUCCESSFUL SALE OF "BUSINESS UNIT AND INTELLECTUAL PROPERTY" AND "ORDERLY SHUT DOWN OF OPERATIONS" -- Gerbsman Partners, January 20, 2004. SUCCESSFUL TERMINATION OF "EXECUTORY REAL ESTATE CONTRACTS" -- Gerbsman Partners, December 2, 2003. SUCCESSFUL SALE OF "INTELLECTUAL PROPERTY" AND "ORDERLY SHUT DOWN OF OPTICAL NETWORKING COMPANIES" -- Gerbsman Partners, July 30, 2003. SUCCESSFUL TERMINATION OF CANADIAN "EQUIPMENT LEASE AND SENIOR SECURED OBLIGATIONS" -- Gerbsman Partners, July 8, 2003. SUCCESSFUL TERMINATION OF "EQUIPMENT LEASE OBLIGATION" -- Gerbsman Partners, May 21, 2003. EURO RSCG MIDDLEBERG AND GERBSMAN PARTNERS ANNOUNCE INTERNATIONAL BUSINESS AND MARKETING PARTNERSHIP -- Euro RSCG Middleberg and Gerbsman Partners, April, 2003. CONTRACT" -- Gerbsman Partners, February 25, 2003. ALLIANCE FOR INTELLECTUAL PROPERTY & INTELLECTUAL CAPITAL -- Gerbsman Partners and McDermott Will & Emery, March, 2002 - Announcing the formation of the Alliance for Intellectual Property & Intellectual Capital. Steven R. Gerbsman speaks at Venture Capital Executive Program - sponsored by the Haas Graduate School of Business at UC Berkeley. Click here for speaker bios. MAXIMIZING ENTERPRISE VALUE FOR UNDER-PERFORMING,UNDER-VALUED AND/OR UNDER-CAPITALIZED COMPANIES AND THEIR INTELLECTUAL PROPERTY -- Speaking Faculty Update -- iiBIG's 2007 Distressed & Turnaround Investment Forum, September 24-25, Las Vegas - Steven R. Gerbsman conference speaker. MAXIMIZING ENTERPRISE VALUE OF DISTRESSED INTELLECTUAL PROPERTY -- 3rd Annual Financing Intangible Asset/Intellectual Property Summit by Strategic Research Institute and the Commercial Finance Association, September 18-19, Frankfurt, Germany - Steven R. Gerbsman conference speaker. OUTLOOK 2006 A YEAR OF CHALLANGE OR OPPORTUNITY -- January, 19, 2006 Steven R. Gerbsman, Moderator at Northern California Turnaround Management Association Kick-Off meeting. MAXIMIZING ENTERPRISE VALUE OF DISTRESSED INTELLECTUAL PROPERTY -- Intellectual Property Financing and Securitization Summit by Strategic Research Institute, New York, September 26-27, 2005 - Steven R. Gerbsman conference speaker. MAXIMIZING THE VALUE OF DISTRESSED DEBT BACKED BY INTELLECTUAL PROPERTY -- The Distressed Debt Summit 2005. Risks, Returns and Rewards. Financial Research Associates, New York, October 6-7, 2005 - Steven R. Gerbsman, Conference speaker. HOW TO ACQUIRE ASSETS & IP FROM A TROUBLED COMPANY: WINNING STRATEGIES FOR MITIGATING RISK -- Dow Jones Private Equity Analyst, March 24, 2005 - Steven R. Gerbsman, Conference speaker. MAXIMIZING THE ENTERPRISE VALUE OF HIGHLY LEVERAGED, UNDER-PERFORMING, UNDER-VALUED AND UNDER-CAPITALIZED COMPANIES -- Tomlinson Zisko - Chautauqua Seminars, March 16, 2005 - Steven R. Gerbsman, conference speaker. OUTLOOK FOR 2005: IN THE TRENCHES FOR WORKOUT PROFESSIONALS -- Turnaround Managment Association, February 8, 2005 - Steven R. Gerbsman moderator. RAISING CAPITAL AND STRATEGIC COLLABORATION IN UNITED STATES -- The Israel Export & International Cooperation Institute Hi-Tech Division, October 19, 2004 - Steven R. Gerbsman conference speaker. ACCESSING THE US CAPITAL MARKETS AND STRATEGIC ALLIANCE/LICENSING OPPORTUNITIES FOR ISRAELI HIGH TECH AND LIFE SCIENCE COMPANIES -- Israel Export and International Cooperation Institute, Tel Aviv, October 19, 2004 - Steven R. Gerbsman conference speaker. CRISIS MANAGEMENT: MAXIMIZING ENTERPRISE VALUE -- Distressed Debt Investing Forum held by Strategic Research Institute, Las Vegas, November 13-14, 2003 - Steven R. Gerbsman conference speaker. Over 50 emerging growth companies attended the conference. CONSULTANTS IN DISTRESSED LOANS: THE PROS AND CONS OF USING ACCOUNTANTS, LAWYERS, AND CRISIS MANAGERS -- Distressed Debt Summit held by Financial Research Associates, New York, October 27-28, 2003 - Steven R. Gerbsman conference speaker. 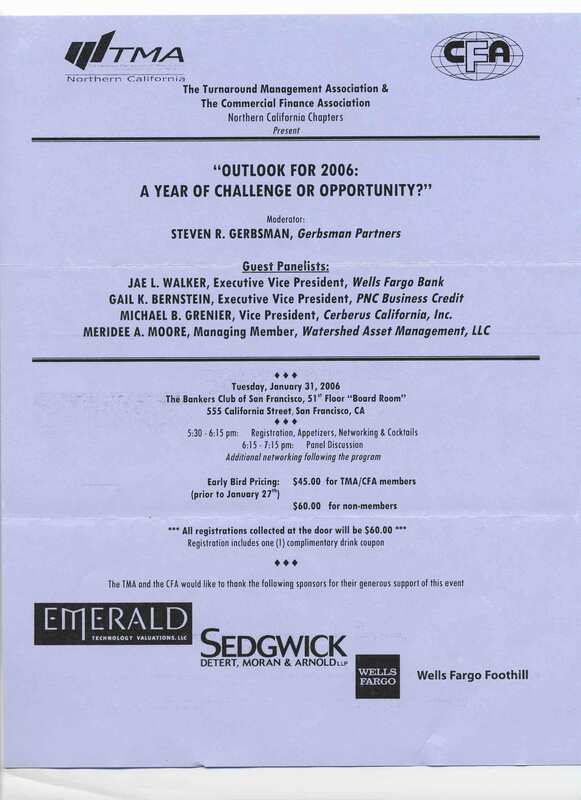 MAXIMIZING ENTERPRISE VALUE FOR TECHNOLOGY COMPANIES WITH PROHIBITIVE REAL ESTATE LEASES -- Distressed Corporate & Commercial Real Estate Forum held by World Research Group, Boston June 30 - July 1, 2003 and San Francisco July 30-31, 2003 - Steven R. Gerbsman conference speaker. EFFECTIVE RESTRUCTURING AND TURNAROUND MANAGEMENT: HOW TO IMPROVE THE ODDS IN TODAY'S ECONOMY -- Distressed Debt Investing Conference held by Strategic Research Institute - New York, June 26-27, 2003 - Steven R. Gerbsman conference speaker. WHAT DOES A CRISIS MANAGER REALLY DO? -- Advanced Commercial Loan Workout Techniques held by Financial Research Associates, New York, March 27-28, 2003 - Steven R. Gerbsman conference speaker. ACCESS THE US VENTURE CAPITAL EQUITY MARKET AND THE US MOBILE/WIRELESS MARKETS -- Israeli Mobile Association, April, 2003. UNCOVER THE HIDDEN IP VALUE TO POSITION THE DISTRESSED BORROWER FOR SALE -- Distressed Debt Investing Conference held by Strategic Research Institute, Chicago, Dec 4-5, 2002 - Steven R. Gerbsman conference speaker. MAXIMIZING STAKEHOLDER VALUE IN HIGHLY LEVERAGED UNDER-PERFORMING AND UNDER-VALUED TECHNOLOGY COMPANIES & THEIR INTELLECTUAL PROPERTY -- Distressed Debt Investing Conference held by Strategic Research Institute, New York, June 25-56, 2002 - Steven R. Gerbsman conference speaker. MAXIMAZING STAKEHOLDER VALUE IN HIGHLY LEVERAGED, UNDER-PERFORMING AND UNDER-VALUED INTERNET/TECHNOLOGY COMPANIES AND THEIR INTELLECTUAL PROPERTY -- Private Placements Industry conference by Institute for International Research, January 24-25, 2002 - Steven R. Gerbsman conference speaker. MANAGING THE DOWNTURN: SURVIVAL STRATEGIES FOR 2002 -- Venturewire, Executive Summit, November 6, 2001 - Steven R. Gerbsman conference speaker. THE DAILY BANCRUPTCY REVIEW -- Dow Jones Newsletters, May 25, 2001 - Comments from Distressed Debt Investing Conference - May 2001. See page 3 and 10. MAXIMIZING STAKEHOLDER VALUE IN HIGHLY LEVERAGED UNDER-PERFORMING AND UNDER-VALUED INTERNET/TECHNOLOGY COMPANIES AND THEIR INTELLECTUAL PROPERTY -- Distressed Debt Investing Conference held by Strategic Research Institute, New York, May 22-23, 2001 - Steven R. Gerbsman conference speaker. Mobile Musings - The Uniqueness of 'Mobile Web 2.0' - By Tony Fish, member Gerbsman Partners Board of Intellectual Capital -- Gerbsman Partners, October, 2007. WIRELESS MARKET UPDATE - MOBILE FLASH MARKET OPPORTUNITIES 2006 -- Gerbsman Partners, San Francisco, May 2006 - Patric Carlsson Gerbsman Partners BoIC & Nader Nejat, Omega Mobile. WIRELESS MARKET UPDATE - Gerbsman Partners GUEST SPEAKER AT MOBILEWEB 2.0 Speaker at the MobileWeb2.0 seminar  London, England, January 19, 2006. Over 150 mobile, financial and media executives participated at the MobileWeb2.0 seminar. The event was sponsored by AMF Ventures, Simmons & Simmons and Gerbsman Partners. Please visit the MobileWeb 2.0 web site for presentation by Gerbsman Partners and all participants. WIRELESS MARKET UPDATE - US WIRELESS MARKET OUTLOOK 2006 -- Gerbsman Partners, San Francisco, DECEMBER 2005 - Patric Carlsson. WIRELESS MARKET UPDATE - MOBILE OPPORTUNITIES BEYOND RING TONES, WALLPAPERS AND GAMES -- Gerbsman Partners, San Francisco, July 2005 - Patric Carlsson. WIRELESS MARKET UPDATE - MEDIA COMPANIES USING SMS TO CREATE NEW REVENUES -- Gerbsman Partners, San Francisco, January 2005 - Patric Carlsson. WIRELESS MARKET BRIEF - US WIFI AND INVESTMENT UPDATES -- Gerbsman Partners, San Francisco, July 2004 - Patric Carlsson. RECENT TRENDS IN THE US TELECOM SECTOR -- Gerbsman Partners, San Francisco, April 2004 - Patric Carlsson. WiFi MERGERS AHEAD! -- Gerbsman Partners, San Francisco, November 4, 2003 - Patric Carlsson. WIRELESS, THE NEXT "DOT BOMB" -- Gerbsman Partners, San Francisco, October 13, 2003 - Patric Carlsson. PREMIUM SMS, WIFI, AND ENTERTAINMENT -- Gerbsman Partners, San Francisco, August 7, 2003 - Patric Carlsson. MAXIMIZING STAKEHOLDER/SHAREHOLDER VALUE OF INTELLECTUAL PROPERTY -- YNet, Israel, August 13, 2002 - Interview with Steven R. Gerbsman. TURNING INTELLECTUAL PROPERTY ASSETS INTO M&A OPPORTUNITIES -- TechDealmaker, May 3, 2002 - Guest column in TechDealmaker by Andrew Sherman and Steven R. Gerbsman. CLEANING UP AFTER DOT-COM CRASH -- Contra Costa Times, Jessica Guynn, April 8, 2001 - Interview with Steven R. Gerbsman. GERBSMAN PARTNERS/TECHNOLOGY RECOVERY GROUP -- Nikkei (Japanese Financial Newspaper), Norri Kageki, November, 2000 - Feature article on Gerbsman Partners and Technology Recovery Group. A SECOND WIND AS A BROADCASTER -- The New York Times, Penny Singer, August 20, 2000 - Sam Albert, Member of the Board of Intellectual Capital. UP IN SMOKE -- Barron's, Jack Willoughby, June 19, 2000 - Dot.coms are still burning cash, but the market has forced big changes. Excerpts from comments by Steven R. Gerbsman. KRISFÖRETAG SOM AFFÄRSIDÉ -- DagensIT, Lasse Winkler, June 9, 2000 - Feature article on Technology Recovery Group. IN TUNE WITH TECHNOLOGY -- Business Journal, Alex Philippidis, February 1, 1999 - Sam Albert, Member of the Board of Intellectual Capital. BACK FROM THE BRINK -- Tom Peters, July, 1997 - Feature article on Steven R. Gerbsman, professional rescuer, hired-gun, crisis-turnaround CEO - Gerbsman Partners. THE BOIC TALKS - MAXIMIZING ENTERPRISE VALUE -- Gerbsman Partners, San Francisco, September 2005 - Richard M. Neiter, Rick Ambrose, Robert J. Dehney and Gregory W. Werkheiser, Christian Murck, Jim McHugh, Robert Tillman, and Steven R. Gerbsman. THE BOIC TALKS - MAXIMIZING ENTERPRISE VALUE -- Gerbsman Partners, San Francisco, June 2005 - Fred Pillon, Gunnar Östergren, Robert Tillman, Andrew J. Sherman, Jim McHugh, Ronald H. Coelyn, and Steve Gerbsman. THE BOIC TALKS - WIRELESS, MUSIC & MEDIA -- Gerbsman Partners, San Francisco, June 2005 - Patric Carlsson, Gerd Leonhard, Hans Ullmark, Don Middleberg, Andrew Sherman, and Steve Gerbsman.